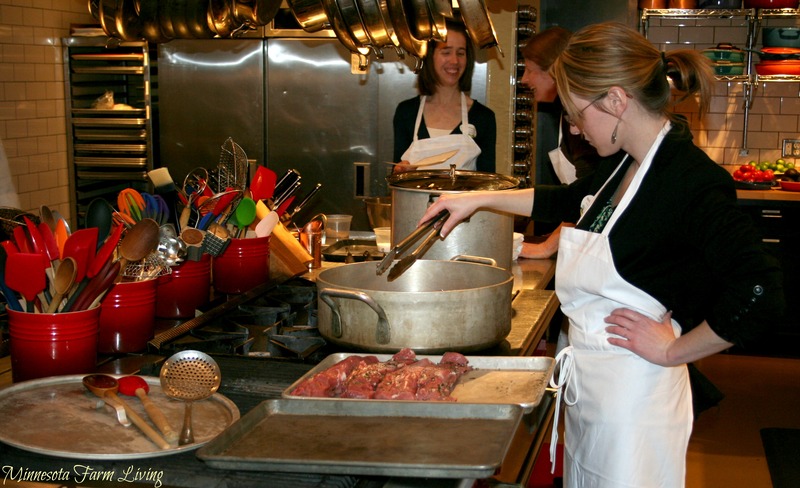 What happens when 24 urban women join 5 farm women and cook a meal together? Let’s just say you would have seen a roomful of conversations, joy, and camaraderie. Food is an emotional topic for many of us and this night of talking about food and preparing it was no exception. We talked, laughed and truly enjoyed each other’s company and at the end of the night, learned a little more about each other. Yes, we found common ground through food and talk. CommonGround is a volunteer organization of farm women who connect with other women answering questions they may have about their food. 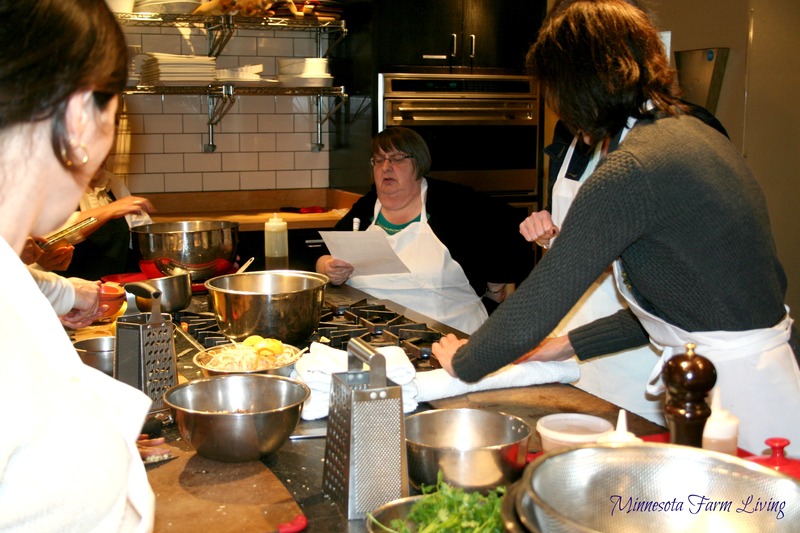 CommonGround invited a cross-section of women from the Minneapolis/St. Paul area to participate in a cooking class held at Cooks at Crocus Hill. These women represented academia, mommy bloggers, nutrition and dietetics and media. As we were preparing the meal, the chefs gave us cooking tips and information. I must admit I grilled Chef Mike on how he cooks pork. Let’s just say he knows his “pork.” When we finished, it was time to eat. And I must say, the food was fabulous! After we finished eating, the CommonGround volunteers sat together in front of our guests for a Q & A forum. With food being such an emotional topic, no question was off the table. The majority of the questions centered around animal antibiotic use and GMOs (genetically modified organisms). There were great questions and we as CommonGround learned a lot also by listening to concerns and questions our guests had about the health and safety of food. Something we all share. On a personal note – I don’t think you can downplay the openness and connectedness that I saw with this roomful of women. Another observation was the genuine passion for agriculture showed by the CommonGround volunteers. It really took me aback as I listened to the other volunteers speak . I am proud to be a part of this group. At the end of the night, I was pleased how well the evening went. I had never been to a cooking class before and somewhat sheepishly, I must admit that I am not very adventurous in my cooking endeavors. But that may change! The only problem of the evening? It ended too soon! Great comments of the night were received and many of them told us they hoped to be invited again. And I do too. Do you have food questions? Be sure to checkout CommonGround or Minnesota’s CommonGround for answers to your questions! Here are a few more links to other questions you may have about your food. What a great event! It sounds like a great time and that a lot of connections were made. It was wonderful Val and loved the connections. It was great! Would love to do more of these!